Dr. Rouff is available to work with individuals and couples involved in building a family through collaborative reproduction. Evaluations include both clinical interviews and psychological testing, including the MMPI-2 and intelligence testing. 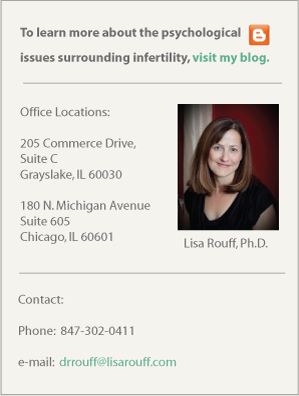 Dr. Rouff also offers consultation services to intended parents building their families through egg donation, sperm donation, embryo donation, or surrogacy. Consultations can help intended parents clarify and understand the psycholgical issues involved in third party reproductions. For more information or to schedule an evaluation or consultation, please contact Dr. Rouff at 847-302-0411 or at drrouff@lisarouff.com.